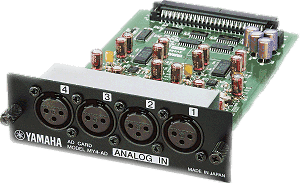 We carry many popular Mini-YGDAI cards for Yamaha consoles. These cards expand the capabilities of the consoles. These are easily installed in many Yamaha Live Sound Consoles: LS9, QL1, QL5, CL5 and more. AV vegas specializes in all types of pro audio sound gear rentals.